This week I will be in almost continuous motion until late Sunday night the 18th. First up, I will be on a business trip to Florida ( Yes, yes, I know...boo hoo for me, leaving the Northeast in a cold snap to go to Florida!). On Wednesday I return, switch bags, and head for San José to record Model Rail Radio show 100. I know that most of my followers here know what Model Rail Radio is all about. However this post is directed at those people who do not. Model Rail Radio is the creation of Tom Barbalet, and I've been a participant from some of the early shows. What Tom has done in the virtual world is recreate the local hobby shop; except that this hobby shop is worldwide. Remember when you could hang out at the local hobby shop on a Saturday afternoon to just chew the fat (remember when there were local hobby shops)? 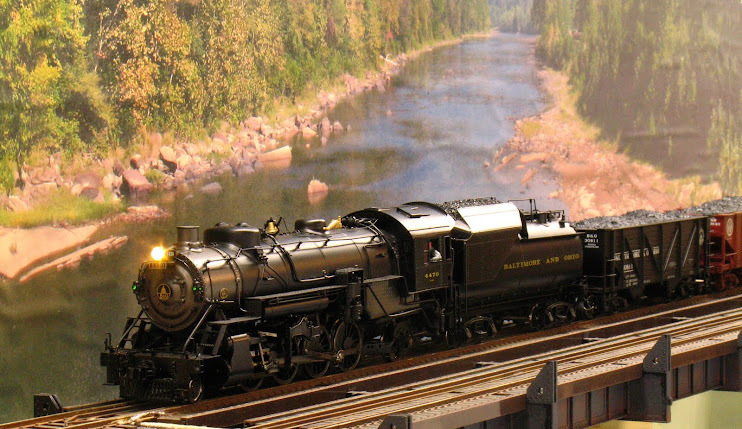 Model Rail Radio is the modern day replacement for the vanishing hobby shop. A bunch of model rails gather via Skype on a Saturday evening and just talk model railroading. Occasionally, "famous model railroaders", names that you would recognize from the magazines, drop in. And, unlike some other model railroading podcasts, MRR is strictly noncommercial. You are free to participate or just listen. Of course, you can be totally passive and download the podcast after the fact and listen at you leisure. Model Rail Radio has almost 100,000 downloads a month; so we must be doing something right! I've made friends all over the globe in this way. And when I do get a chance to meet them, we meet and greet as long fast friends. I had heretofore pooh-poohed social media; now I'm a firm believer. Participation in MRR has opened new vistas for me. As a technologist by trade, I have long eyed 3D printing and the application of microcontrollers to model railroading. MRR gave me the confidence not only to plunge ahead with these technologies, but to popularise them through a series of clinics. And I've made the contacts to present these clinics at the NMRA national through MRR. To my fellow O scalers, we have a somewhat deserved reputation as grumpy old men, set in our ways, practitioners of archane rituals and resistant to change. I remember an article that Lorell Joiner did for Model Railroader in which he described O scalers as "hitting their cast bronze boilers with ball peen hammers and listening to the bell-like sounds.". The article was accompanied by a cartoon of someone attacking his O scale model with a full-size welding torch. Exaggerated maybe, but with a ring of truth to it. So I invite my fellow O scalers to join us for show 100 and shed the technophobic curmudegon image. Tom is a nacent O scaler and Jim Lincoln (P48) and I will be sharing hosting duties from time to time during this marathon show. Let's have a good turnout of O scale for this show! You will need to install Skype on your computer (instructions can be found all over the web). You'll need a microphone if your computer does not already have one. Clicking on the MRR logo in the left column of this blog will take you to the MRR website for more detail. The show will be recorded on Saturday Jan. 17 from 10 am to 9 pm, Pacific time; so there must be some time when you can tune in. For those who are attending in person, Friday there are a whirlwind of activities planned. Layout tours, a DCC lunch, an operating session and a dinner. I hope that I make it to Saturday! Since this post will be up long after show 100 is in the record books, join us for subsequent shows. Shows are recorded about every two weeks on a Saturday evening (eastern time). I think that you will find it enjoyable time with friends sharing their projects and experiences. There are layout design contests and MRR swag. You'll pick up new techniques along the way and get pumped up for you next model railroading project!